The Bell Moto-3 Helmet is the perfect helmet for riders who prefer the vintage style of classic and retro scramblers, dual-sport and enduro bikes. 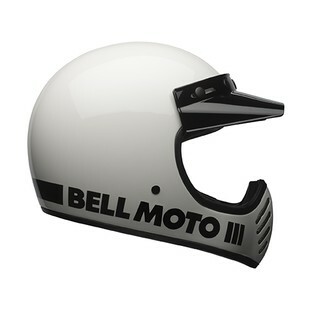 The Moto-3 offers the no-frills look of a vintage helmet but with the safety and comfort of a modern one. Available in 5 solid colors and two graphics, the Moto-3 is sure to look great with a variety of bikes and styles of riding gear. It comes in 3 different shell sizes to keep the profile to a minimum and will work with most motocross and vintage style goggles. The 5-snap visor can be easily removed if you are after a more streamlined look. Most riders can appreciate the cool style of bikes from the 60s and 70s. Many manufacturers are offering several "retro" bikes in their lineup as well. Bell is thankfully aware that riders want gear that is aesthetically in-tune with their vintage machines. The Moto-3 is a welcome addition to today's world of vintage inspired gear.